Like the comic? Like the show? What're you waiting for? Buy the damn book! This is the quote on the front of the jacket. I've not read the comic. I've not seen the show. However the quote is from Brad Meltzer and when he tells me to do something I do it without question. It also gives me the opportunity to review something the entire world knows about with an open mind. Ever since she could walk, Homicide Detective Deena Pilgrim followed in her father’s footsteps. A man with a badge, Waldo Pilgrim surrounded himself with what Deena believed to be the cream of the crop when it came to serving and protecting. These days, Deena won’t discuss her father or the life she left behind in Atlanta years ago, a life before she partnered with Christian Walker to investigate homicide cases in a city where perps and victims boast incredible, dangerous powers. Now, nearly a decade of bringing Powers to justice has broken down Deena’s resolve, along with the walls she erected long ago to protect herself from prying eyes. Walls that kept her from a past best left alone, and from those determined to get close and bring horrible, heartbreaking memories to the surface once more. But when a cold case reopens a series of unsolved murders that point back to Deena’s family tree, she is unavoidably reacquainted with a former boyfriend with ties to both sets of killings, along with her sordid past. Forced to question the choices, decisions, and steps she’s taken in life, love, and career -including her long-standing partnership with Walker, a former Power whose secret history intersects with Deena’s own - Detective Deena Pilgrim must bring a killer to justice and, in doing so, hopefully come to terms with the kind of cop she wants to be... assuming that she wants to continue being a cop at all. Well, this was like no comic book tie in I've ever read! 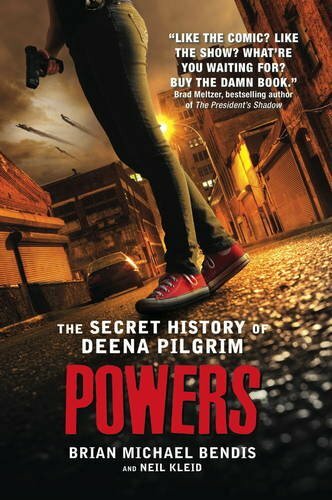 I'm not going to mention the comic thing again, as to be honest, whether I'd read it or not really doesn't seem relevant as The Secret History of Deena Pilgrim is most definitely a great book in its own right. The story was grisly, twisted and dark from the get go and the characters fleshed out incredibly well. I found Pilgrim to be a mixture of a messed up, snarky, full of rage character that also had some wonderfully redeeming qualities with her loyalty and honest complexity that made for a great read and some interesting commentary in my head as the story goes along. The crime storyline was interesting and gripping but I felt maybe the book was more about Pilgrim than the plot although it still worked very well. Walker's character adds some great conversation to the mix and I think if this was an original piece of detective fiction that relationship could have been expanded on really well but there was certainly enough to keep me interested and reading to the end. I liked the way the two authors worked with Bendis, the characters creator, seemingly outlining plot and direction and Kleid filling in narrative and it certainly works a lot better than some collaborative efforts do. Is it enough to make me go and discover the comic? Probably not, as I can't see the comic format adding more to the characters than you'll get in novel form, but I will certainly be checking to see if Neil Kleid has written any original detective fiction as I liked his delivery of conversation and where his descriptions took my mind.